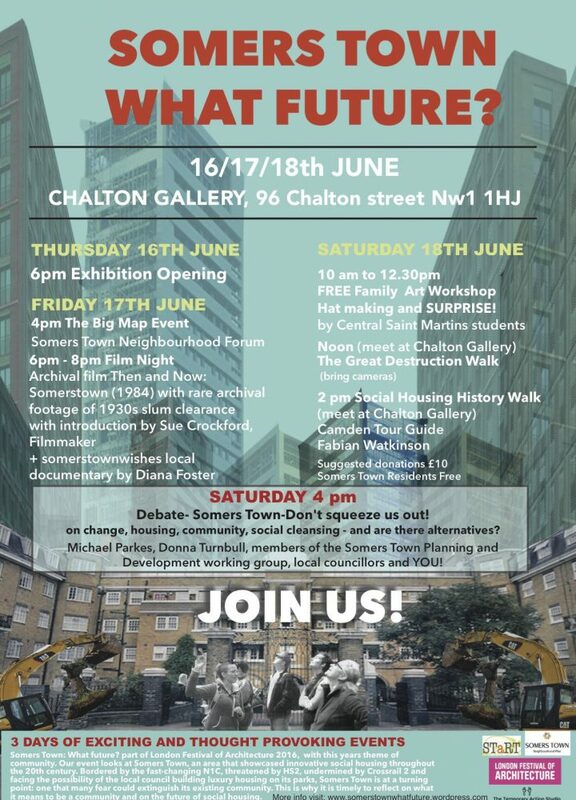 Somers Town archival films and photos feature in an event called Somers Town: What Future? next week. What are the history highlights? Locals are invited to join in – come along to the exhibition, or add your photos here. All new photos will be displayed in alongside archive photos – so ‘Then and Now’. A walk on Saturday 2pm with Camden Tour Guide Fabien Watkinson – you may learn something new about Oakshott Court! June 16-18th 2016 meet at local Chalton gallery in Chalton Street. We did a recee today with Fabien and long time Somers Town residents George, Doug and Mimi had plenty to add!